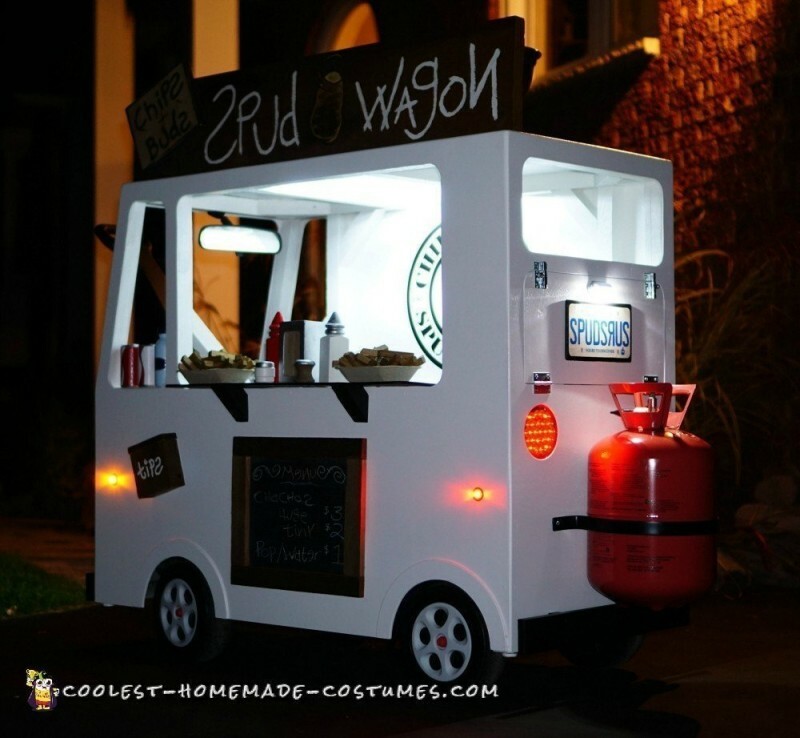 I wanted to make something unique this year that I’d never seen before – when I first thought of a fry truck costume, I thought it was perhaps a bit odd, but ran with the idea! 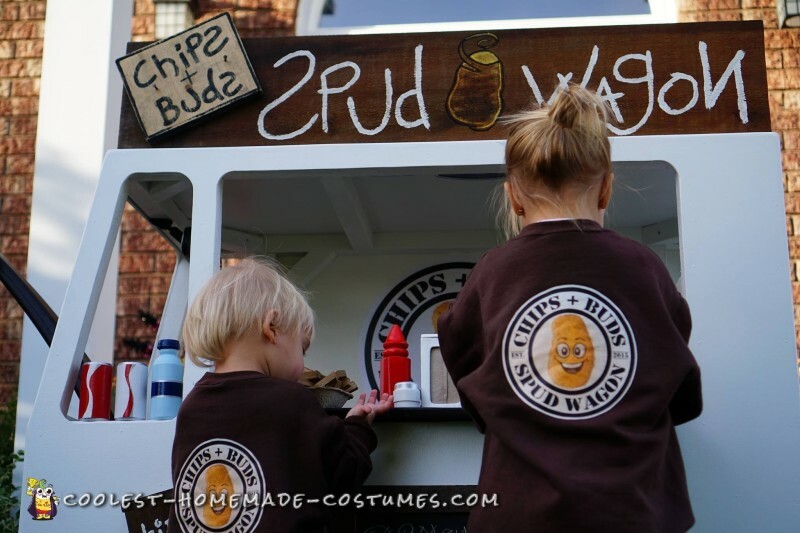 “Chips” and “Buds” are our kids nicknames, they call french fries “chachas” (from when our girl first started talking) and everything is “tiny” or “huge” to them at this age! 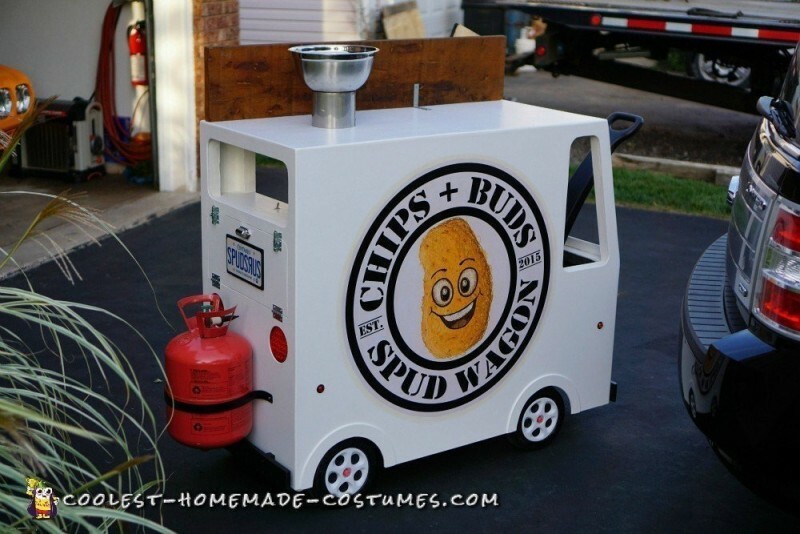 The “Spud Wagon” slips over top of our Little Tikes wagon and is constructed of 2×2″ wood framing covered with 1/4″ plywood. 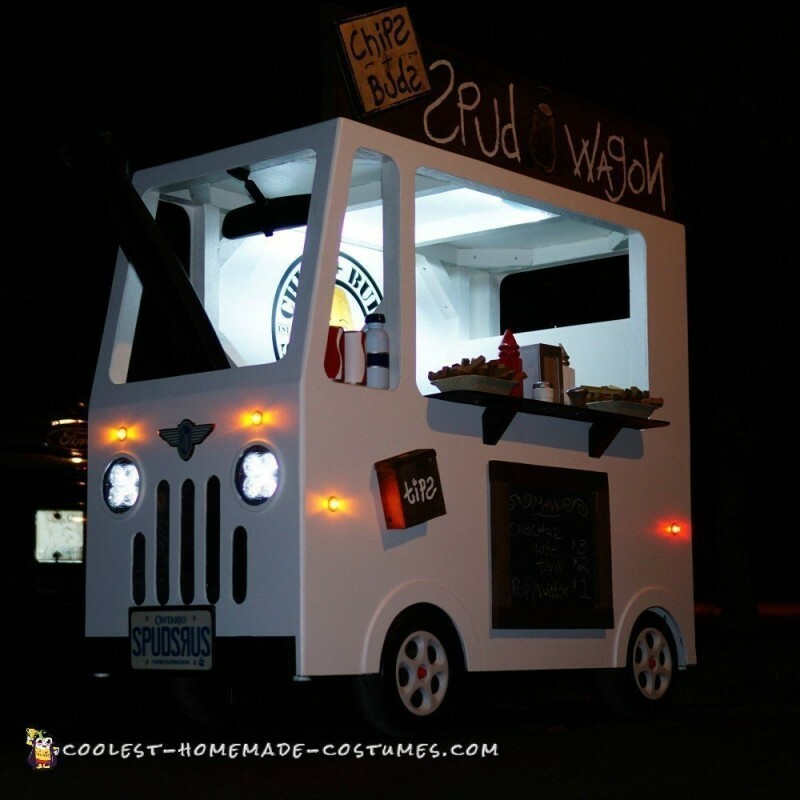 The french fries are stained/cut up 1/2″ square dowels. 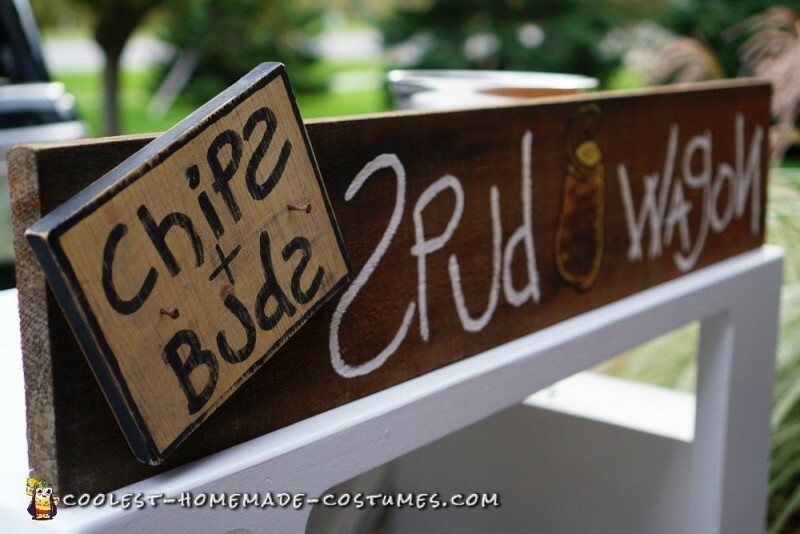 The drinks are 2″ dowels and the condiments all started off as a single baluster. The lighting is all 12V LED and borrows our lawn tractor battery for power (stored in the “trunk” behind the rear plate). I found the helium tank on the side of the road. 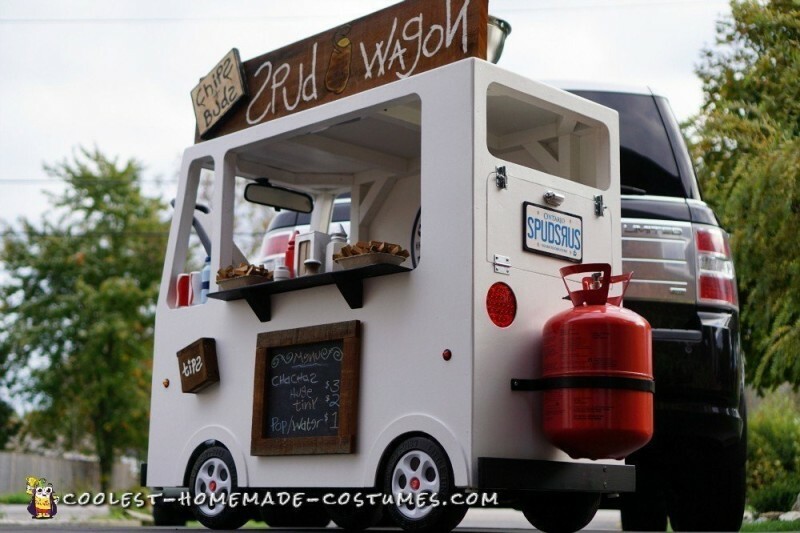 There is standard house window screen behind the grill openings to make it look more realistic. The rear-view mirror was a spare part from an old car I threw on because I had it laying around. The bumpers are 3” trim left over from my garage and the tank is mounted with a scrap piece of steel bar I bent by hand to fit the tank. The logos/plates/badge on the wagon are all printed paper that is glued onto the plywood, then sealed with clear coat to protect it from the weather (preparing in case we get rained on like we did last year!). The plates are an obvious play on a popular kids’ store name. The napkin dispenser is also made of plywood complete with a mini-napkin made up from a paper towel. 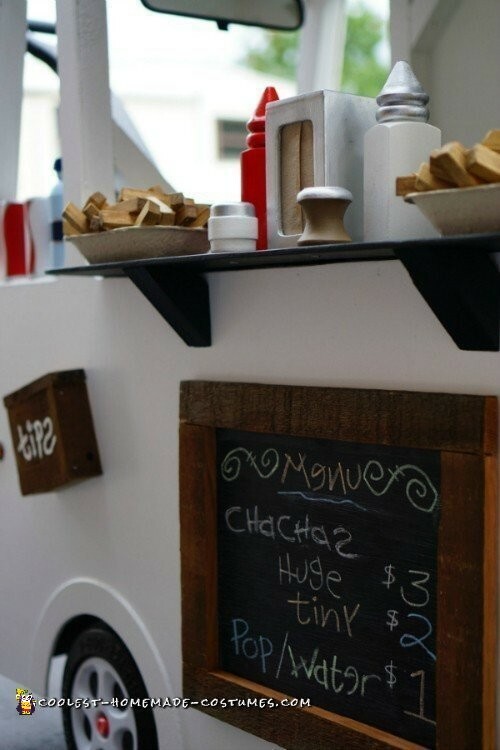 The menu is plywood painted with chalkboard paint and framed with the same rough pine used on the main sign and tip box. I used various colours of the kids chalk and tried to make the writing very “kid like” to also match the main sign and tip box. 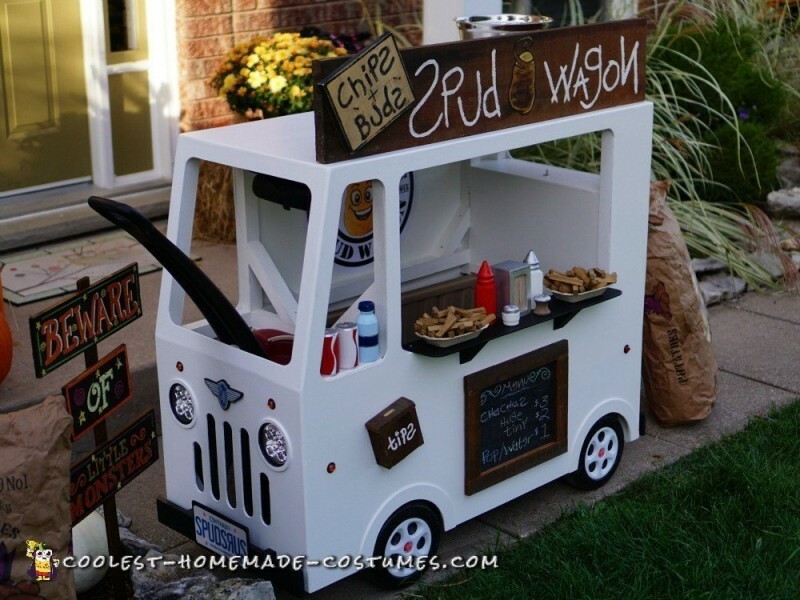 The main sign, wagon, drinks and condiments were all painted by hand/brush and the wagon itself with a roller. The rough pine was “aged” with a vinegar/steel wool solution for an antique look – something initially intended for a home renovation project, but I decided to make use of it here. The exhaust vent is a stainless steel bowl and a small piece of scrap exhaust piping from our old furnace. 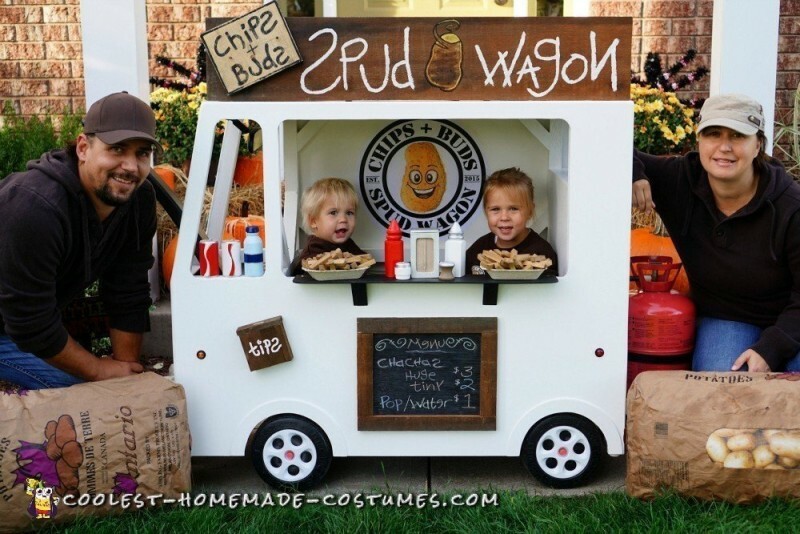 Mom & Dad are helpers carrying around the potatoes – the bags are real, but filled with pillows and a printed picture of potatoes so it looks full through the little window. I made up custom shirts for the kids with the logo on the back and logo/nickname on the front. 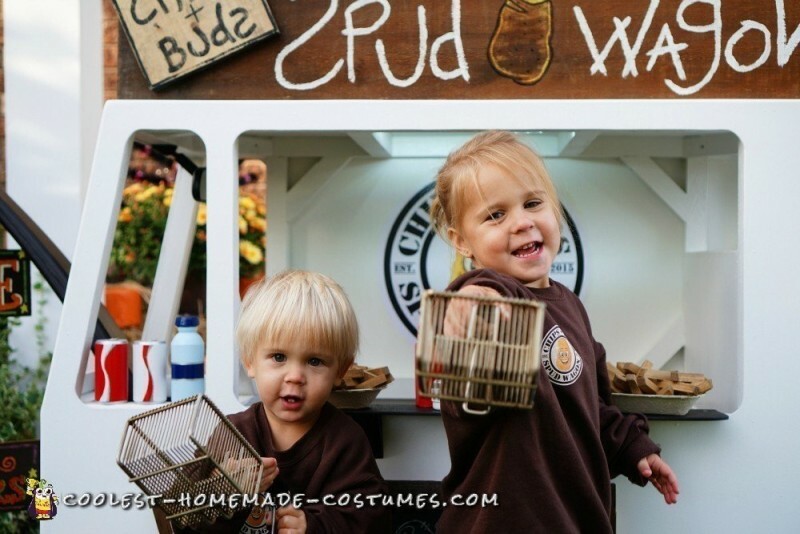 Lastly, the kids have real mini deep fryer baskets to hold out for Trick or Treating. 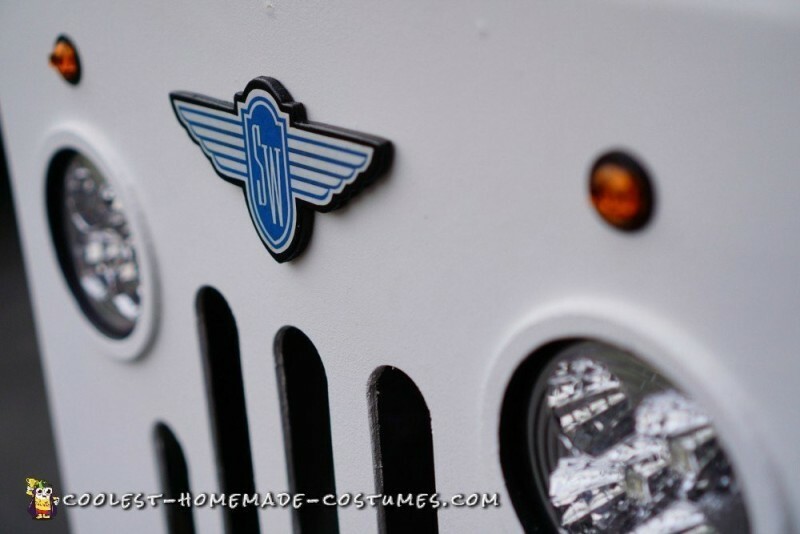 I had much of the material around the house but still have probably ~$150 into the project (mostly the automotive lighting and the 2×2″ lumber) – overall it was very fun to build and the end result was/is well worth it! We went to a local Halloween event at our local zoo today with thousands of people – adults and kids both loved it and many said it was the best costume they’d ever seen! We entered the contest and won first prize for 0-5 year olds. Cool Sushi Costume – 100% Homemade!